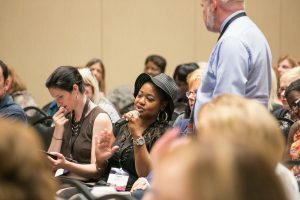 NCRA Immediate Past President Tiva P. Wood, FAPR, RDR, CMRS, was one of several professionals quoted about their predictions for the future of the profession in a press release issued on Sept. 19 by Esquire Deposition Solutions, Atlanta, Ga. Wood and others were interviewed during the 2017 NCRA Convention & Expo held in August in Las Vegas, Nev. I am very appreciative for the time I got to spend at the 2017 NCRA Convention & Expo in Las Vegas. 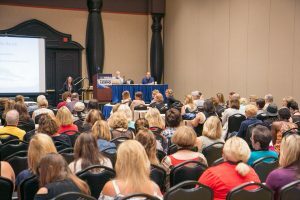 What a fun and vibrant location for court reporters to come together and connect as a community! On our first day, we visited the Expo Hall and got to explore many innovations in reporting technology. Things that I never even thought of, like ergonomic machines, different types of travel bags, all kinds of software, and much more, were on display. We got some great swag and were able to connect with vendors from all types of companies related to the field. I loved the neon light-up writer! It was amazing to see all of the different types of new technology associated with the Stenograph machines knowing that I will soon be purchasing my own when I finish school. I really enjoyed watching a demonstration involving the audio-recording capabilities of the Luminex writer. Not only can you direct it to go back to the last question you asked in a testimony dictation, but the audio-sync feature allows you to listen to the actual dictation in addition to seeing the question on your screen. If only I had that available during tests! My favorite part of the Convention was the being able to speak with reporters from all different fields. It was exciting to have so many people come up to us, knowing that we were students, and introduce themselves. All of the pros were so warm and welcoming to us. People from all over the country were so happy to see us students and had nothing but the most encouraging things to say. I even spoke with the President of NCRA multiple times and felt great about it. It was inspiring to see that many of the people we spoke with actually won awards for the Speed and Realtime Contests and were honored during the luncheon. An especially good time for networking was in the “Steno Speed Dating” part of the first day of the student track. We got to sit with very successful reporters, including speed contest winners, realtime writers, captioners, and even a court reporter who worked in the House of Representatives. It is inspiring to see the places that this career can take you if you apply yourself. I also appreciated hearing about these professionals’ school experiences and what the biggest struggles were for each of them. I got some practice tips and some great advice as to how I can clean up my notes and build my speed at the same time. Another very beneficial session was “Business of Being a Court Reporter.” There, we got to see a mock deposition take place with a panel of professional reporters pausing to explain certain parts of the process. They would also tell us what they would do if something unusual would happen and frequent issues that may come up on the job. I am very thankful that I was able to attend this Convention as I found it reinvigorating for me as a student. School can be stressful sometimes, but seeing all of these successful women and men in the field made me feel like I was on the right track and I have a great life to look forward to in this field. Ariel Kraut is a student at MacCormac College in Chicago, Ill. She can be reached at akraut@maccormac.edu. 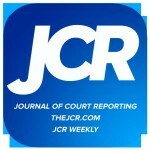 Read “Finding court reporters’ paradise” by MacCormac student Brianna Uhlman. The NCRA Convention & Expo is like the Shangri-la of court reporting. The things you learn, the relationships you build, and the experiences you take with you are irreplaceable. You leave motivated to finish school and determined to make the most out of your time in this profession. The Expo Hall at the NCRA Convention is truly a magical place. Even as a student, the exhibitors are so willing and eager to talk to you and show you all that is new in the world of court reporting. In the Expo Hall, you can learn so much about the newest technology, whether it’s machines, updates in software, etc. You get to test out different machines from all different vendors. 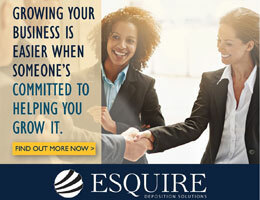 You have the opportunity to learn about several different companies that are involved in the court reporting world. You have the opportunity to talk face-to-face with some of the business owners and representatives who you will be working with for the rest of your career. And you can win so much free stuff! Getting the chance to mingle with some of the top reporters around the country and the globe is such an invaluable experience. Talking with members of the Board, speed contest champions, and the like is extremely motivational. For me personally, I come from a small town with small dreams and not a lot of opportunity. When first enrolling in court reporting school and joining the court reporting community, I had no idea where this career could take me. 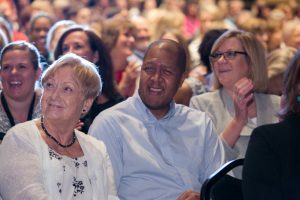 But at events like the NCRA Convention, you get to know these amazing and successful people who may have come from a situation similar to yours. But because of this profession and all of the opportunity and their personal hard work and dedication, they have taken themselves so far. It makes you dream bigger and work harder for those dreams. It shows you that no matter your background or your current standing, there is no limit to where this profession can take you. If you work hard, stay motivated, and keep pushing yourself to get through school, you can have a very successful and fulfilling career. Having the opportunity to talk to other students from all over the country is so encouraging. It really makes you realize that you are not alone in the struggles of court reporting school. There is a whole community of students who are having difficulty with speeds, getting stuck in similar areas, and experiencing the same discouragements you are experiencing. But being able to discuss these experiences and learn about other people’s techniques and tricks is so helpful. They are there to encourage you to keep going. Seeing the resilient spirit of other students is inspiring. Experiencing the genuine care and comradery from other students creates such an honest atmosphere of support and sincerity. It truly is a community of people that want to see you succeed in this profession, and that is just not something you see very often. I am so thankful for the court reporting community. And I am so thankful for the NCRA Convention & Expo that creates the opportunity for this community to come together and create positive, long-lasting impacts on its members and their profession. Brianna Uhlman is a student at MacCormac College in Chicago, Ill. She can be reached at brianna.uhlman@gmail.com. 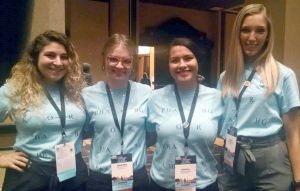 Read “Highlights from the 2017 NCRA Convention & Expo: A student’s experience” by MacCormac student Ariel Kraut. 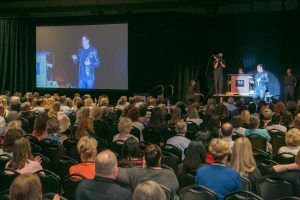 Steve Wyrick, known as the Daredevil Magician, brought some extra-special magic to the 2017 NCRA Convention & Expo during his keynote address at the Premier Session. He performed several illusions, including bringing Ms. Pac-Man to life from an old video game console, linking together three rings provided by members of the audience, and turning a $100 bill into a $1 bill – and back again, to the relief of the attendee who had supplied the original $100. Unfortunately, Planet Hollywood (along with Paris and Bally’s) lost power for a couple hours during Wyrick’s presentation, but when the lights came back on, attendees had the opportunity to see the rest of the show. The grand finale of Wyrick’s performance was essentially a “steno mad libs.” Wyrick told a fictional story of a couple court reporters who had snuck out to a casino on the Strip, had a good time, and came back late the next day. Members of the audience predicted the names of the reporters, the casino, their preferred drink, and the time the reporters returned. In the midst of this, Wyrick talked about an alleged Aunt Mable who had been a reporter and said he’d become interested in steno and went on YouTube to teach himself how to write in steno. He drew the audience’s attention to a box that had been hanging from the ceiling. When the story was complete, he brought the box down and, to the audience’s delight, he pulled out a ream of steno paper with the audience’s predictions to the story written in steno. Throughout his presentation, Wyrick highlighted some of the ways that court reporters and magicians are similar. He pointed out that both reporters and magicians work with their hands. They are sworn to secrecy — reporters know that they must handle confidential information carefully. Everything has to be perfect with fine attention to detail. And both reporters and magicians find success with thorough preparation, including developing a backup plan and working through logistics. Other highlights of the Premier Session included the recognition of international attendees from eight different countries, certification holders, and past presidents. Joanne Lee, RPR, a Florida reporter who works with Esquire Deposition Solutions (the Premier Session sponsor), provided an update on the work that the company has been doing to help students successfully complete online programs and to get millennials more involved in the profession. 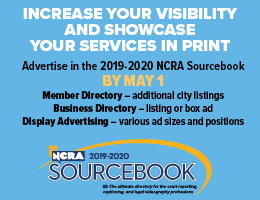 NCRA’s 2017-2018 Board of Directors was installed, including NCRA Immediate Past President Tiva Wood, FAPR, RDR, CMRS, being magically transformed into NCRA President Chris Willette, RDR, CRR, CRC. 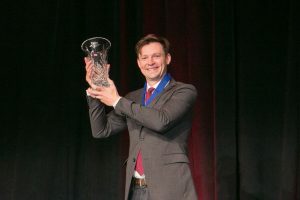 Ed Johnson, FAPR, RPR, CRR, introduced his fellow Wisconsinite with a top ten list of “things you may not know about Chris Willette,” including a quip that in a Speed Contest, if the topic was cheese, Willette could beat Mark Kislingbury, FAPR, RDR, CRR. Willette gave her first address to the membership, which focused on the importance of hard work, service, and perseverance. And Nancy Varallo, FAPR, RDR, CRR, was recognized as the 2017 Distinguished Service Award recipient. As she accepted the award, Varallo thanked all of her mentors who have helped her get to this point. Lindsay Stoker, RPR, CRC, from Fullerton, Calif., provided the on-site CART captioning for the event. Karen Teig has extensive experience volunteering and serving on boards in both her personal or professional life, and she has had specific training on how to advocate for a philanthropic project. This has given her a thorough understanding of what it takes to be both a worker and a leader. She has served on numerous state and national committees; is a past state and national board member; and is past president of her state association. Teig has a true spirit of giving back and has been a long-time supporter of NCRF, whether promoting NCRF during state rep visits, transcribing histories for the VHP program, helping raise funds through her service on the Angels Drive Committee, or donating to NCRF through the Angels program. Sandy VanderPol is a committed volunteer who has contributed extensively to the profession by writing articles, giving presentations, and serving on many court reporting association committees and boards. She has strong leadership experience, having been president of both her local and state court reporting associations. 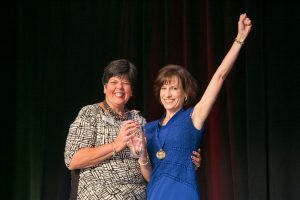 VanderPol’s accomplishments are well known as the recipient of NCRA’s Distinguished Service Award, and she is highly respected within the NCRA membership for her work ethic, ability to think outside the box, and intimate knowledge of and passion for the profession. The new Trustees will be joining NCRF Chair Nancy Hopp, FAPR, RDR, CRR, CRMS, St. Louis, Mo. ; Secretary Debra Dibble, RDR, CRR, CRC, Woodland, Utah; Debra K. Cheyne, M.A., CSR, Sherwood, Ore.; Jane Fitzgerald, RMR, Pleasant Hill, Iowa; Tami Keenan, FAPR, RPR, CPE, Battle Creek, Mich.; Cregg Seymour, Baltimore, Md. ; and Nancy Varallo, FAPR, RDR, CRR, Worcester, Mass. Jeffrey Weigl, RMR, CRR, CRC, from Edmonton, Alberta, Canada, repeated as the 2017 Speed Contest champion. Weigl won with an overall score of 97.268%. John Wissenbach, RDR, CRR, CRC, of San Francisco, Calif., earned second place overall with a final score of 96.382%. Weigl and Wissenbach were the only two contestants to qualify in all three legs of the contest. Dee Boenau, RDR, CRR, CRC, of Sarasota, Fla., earned the blue ribbon for the Literary leg of the Speed Contest while Weigl earned the top spot in both the Legal Opinion and Testimony legs. Boenau also repeated her Realtime Contest win from 2016. Boenau previously won the contest in 2010 and 2016, bringing her total Realtime Championships to three. Weigl placed second overall in the Realtime Contest with an overall score of 98.117%. Doug Zweizig, RDR, CRR, took third with a score of 97.875%. A four-way tie for the testimony leg of the Realtime – with 12 errors each – had Boneau; Zweizig; Mark Kislingbury, FAPR, RDR, CRR; and Jennifer Schuck, FAPR, RDR, CRR, CRC, earning blue medals for their efforts. The Speed Contest consists of three legs: literary at 220 wpm, legal opinion at 230 wpm, and testimony at 280 wpm. Contestants have a total of 90 minutes per leg for transcription. The Realtime Contest consists of two legs: literary at 200 wpm and testimony at 225 wpm. Contestants turned in an RTF or ASCII file immediately following the end of dictation. In both contests, contestants must receive 95 percent accuracy to qualify; accuracy also determines the winners. 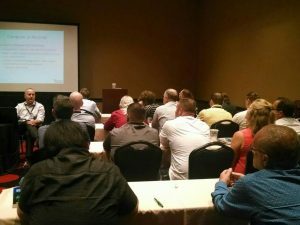 The contests were held at the beginning of the NCRA Convention & Expo, Aug. 10-13 in Las Vegas, Nev.
View the Speed Contest results. View the Realtime Contest results. * Contest results are preliminary.